This Deadly river creature is the Giant Goliath Tiger Fish. 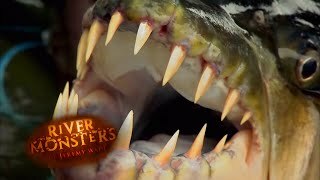 This river monster can be found living in the Congo River basin, Lualaba River and Lake tanganiyika in Africa. The Goliath Tigerfish can reach lengths up to 5 feet and weigh up to 154 pounds. It is the largest member of a genus of fierce monster predators with 32 razor sharp, dagger like teeth that can tear through even a solid steel wire. Outclassing any other African game fish in speed and power it loves turbulent waters where less powerful fish struggle, making them vulnerable to attack. Showing now fear of crocodiles, this fearless monster is known to eat smaller ones and has attacked humans in rare instances. It is lightning quick and forceful and can be an anglers worst nightmare because the fish not only will snap a line, but make off with the fishing tackle as well. This monstrous predator has excellent eyesight and can sense low-frequency vibrations emitted by prey. It strikes with the brutality of piranha and has been reported to attack 60 pound catfish and slicing them in half. If you're looking for a challenge, the goliath tigerfish has been ranked by "In Fisherman" magazine as one of the top 10 hardest-fighting freshwater fish on the planet.